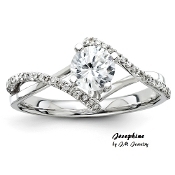 "Josephine" style is unique, it has open sides which will show off the brilliance of the center diamond. This ring is 14KT White Gold and hold one (1) 1/3ct Genuine Round Brilliant Cut Center Diamond. The ring also has forty-two (42) Round Brilliant Cut diamonds that total 1/8ctw. The diamonds are SI in clarity and G-H-I in color.